The conversion of synthesis gas offers the opportunity to take a wide range of organic fuel stock (e.g. natural gas, coal, heavy oil residue, biomass, etc.) and convert it into liquid fuels and/or valuable chemicals. The production of synthesis gas typically proceeds through a gasification/reforming process. The further conversion of synthesis gas can proceed via a number of processes, such as the methanol synthesis and the Fischer-Tropsch synthesis (FTS). In addition synthesis gas can be utilised as well in e.g. hydroformylation (oxosynthesis), as source of hydrogen or in a ‘direct synthesis’ of chemicals such as oxygenates or aromatic compounds. 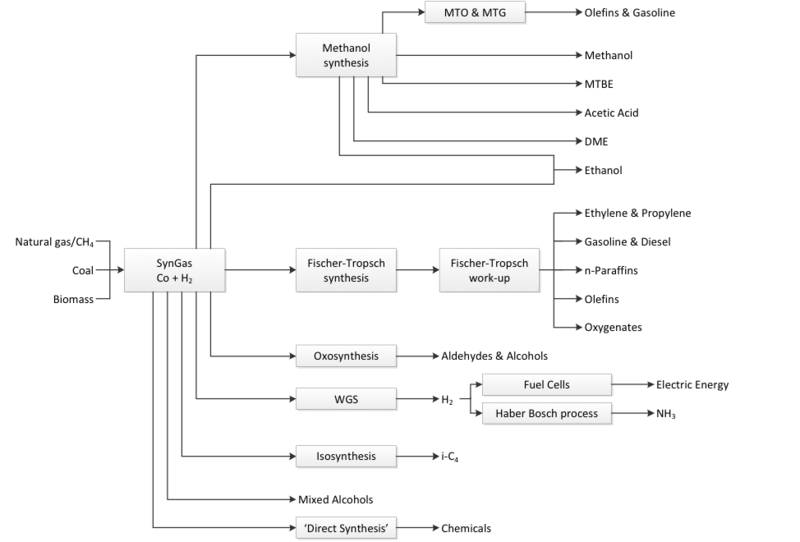 The conversion of synthesis gas into methanol is a well-established process. Methanol can subsequently be converted into fuel and petrochemicals. The low pressure methanol synthesis over copper based catalysts has been proven successful on an industrial scale by ICI (now Johnson & Matthey) and is being considered competitive to the Fischer-Tropsch technology by some industrial players. South Africa is currently world leader in the area of Fischer-Tropsch synthesis and the Centre of Excellence is tasked to ensure that South Africa remains in this leading position. Factors resulting in improved catalyst activity in the Fischer-Tropsch synthesis are reasonably well understood and will not be investigated in the programme. Tuning the selectivity is however due to the nature of the reaction mechanism a major challenge. By definition, the Fischer-Tropsch synthesis is a poorly selective process, in which only partial optimisation can be achieved. The selectivity towards classes of products can be optimised, such as the formation of liquid products (typically defined as C5+-selectivity), olefins and oxygenated compounds (alcohols, aldehydes, ketones and carboxylic acids). The syngas programme will focus on the identification of selectivity steering mechanisms in the FT based synthesis gas conversion. This includes the modifications of the FT synthesis conditions towards a direct synthesis of chemicals as well as combining the Fischer-Tropsch synthesis with product upgrading processes such as hydrocracking and isomerization. In the newly established project SYN-06, the expertise acquired in synthesis gas conversion processes will be transferred to new processes focusing on the utilization of CO2 using heterogeneously catalyzed reactions.